Add to calendar 2019-08-11 11:00:00 2019-08-11 17:00:00 +00:00 31st Annual Art on the Commons Presenting one of the Dayton area’s most popular arts festivals, back this August for its 31st year! 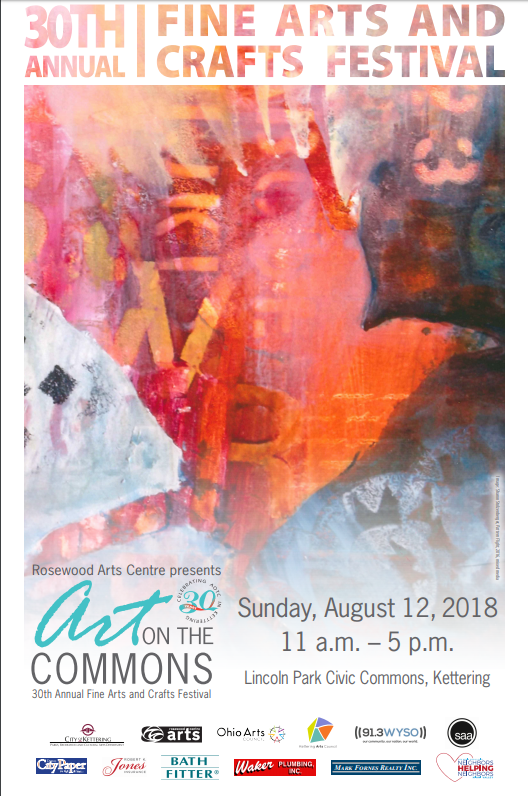 Rosewood Arts Centre is pleased to announce Art on the Commons at Kettering’s Lincoln Park Civic Commons. Scheduled for Sunday, August 11, from 11 am until 5 pm, Art on the Commons features fine arts and crafts by over 100 talented artists from throughout the United States. Artwork for display and sale includes ceramics, digital art, fiber/leather, glass, jewelry, mixed media, painting, photography, sculpture, works on paper and wood creations. For full details on Art on the Commons, please visit its homepage. Presenting one of the Dayton area’s most popular arts festivals, back this August for its 31st year! Rosewood Arts Centre is pleased to announce Art on the Commons at Kettering’s Lincoln Park Civic Commons. Scheduled for Sunday, August 11, from 11 am until 5 pm, Art on the Commons features fine arts and crafts by over 100 talented artists from throughout the United States. Artwork for display and sale includes ceramics, digital art, fiber/leather, glass, jewelry, mixed media, painting, photography, sculpture, works on paper and wood creations.